Wall Street’s Socialists – Did You Check First? These are the real Socialists in America today(1). No, not Socialism in the text-book definition of the word. I mean something more heinous: a dystopian form of capitalism in which all the gains are privatized and all the losses are socialized. Why is that? Why do the all-knowing and all-powerful “invisible hands” on Wall Street who control the world’s finances and our so-called free market start wringing those hands and selling off stock at the thought of fewer stimulus dollars? Shouldn’t they be overjoyed? What happened to all the confidence they profess to have that capitalists and corporations would thrive if they were simply left to their own devices? And, where are the cheers from the GOP, tea partiers, and Randians on the right for Bernanke’s announcement? Why are “investors” (and let’s be clear, they don’t mean us) selling stocks when corporate profits are generally at historic highs? I know. Buy low, sell high. So, has the high been reached? Could it be that those highs have been achieved at least in part because there was federal stimulus being pumped into the economy? 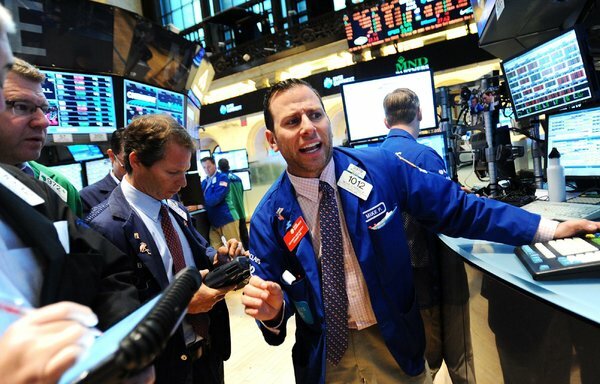 Could it be that Wall Street is having their tantrum now because they know the truth: that tapering back now is a bad idea? After all, some really smart people who have won Nobel Prizes for how much they know about economics have been telling us that the recovery hasn’t been all that great – except on some paper and in reality for an infinitesimally small number of people – precisely because there has been too little stimulus. Wall Streeters and banksters are a lot of things. One thing they are not is stupid. They know that corporations won’t do so well once the Federal Reserve tapers back. They have to know what many of us know: that on some very disturbing levels austerity has proven to be a complete failure. Austerity does not lead to growth. If the Feds curtail stimulus now without a healthy, prosperous, and confident middle class, the whole charade of corporate profitability will be revealed and proven to be unsustainable. Can’t you just see Wall Street coming back to the federal government again to be bailed out? Let’s hope that this sell-off wakes up our elected leaders. Wall Street needs much more and much tougher regulation, and they need it now. The big banks created out of the fiasco that was the GOP and W administration – yes, it’s still his and their fault and always will be despite all the attempts to rewrite or ignore history – need to be broken up, and they need to be regulated under new Glass-Steagall-like regulations on steroids. Our only hope as citizens will be to vote for politicians like Bernie Sanders, Elizabeth Warren, and Sherrod Brown who also believe that our society requires a stronger government that protects us from the unfettered greed of people running banks and big corporations. It is their big and dark money, and the influence it has over our politicians, that represents the real threat to our society. (1) I’m not claiming that the gentlemen specifically pictured above are socialists. I don’t know them or their politics. This is merely symbolic metaphor. Pingback: Republican voters: You have more in common with #Sanders than you probably want to admit | Did You Check First? Pingback: White-collar workers: You’re in trouble, too. | Did You Check First? Pingback: Let’s #NeverForget915 and the Lies of Trickle-Down Economics | Did You Check First? Pingback: Whale-Sized Gambles, Lies, and Empty Apologies | Did You Check First?